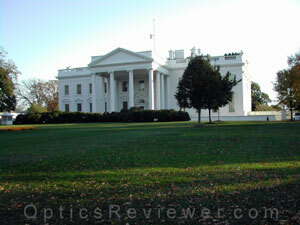 We recently had an opportunity to tour the White House in Washington, DC. Of course, the various security elements were interesting. We had to provide copies of our identity documents well in advance of our tour date. When the day drew near we were told what we couldn't take inside — including cameras, handbags, and "pointed objects." There was a long line to work our way through and several security elements before getting inside the White House through a side entrance. Inside it was fascinating to look at the various things we'd seen on television and see how different it really looked. The room the president holds press conferences in? It's not nearly as large as it appears on the television! What really captured our attention, though, was what we saw when the tour was over. We had just stepped outside the front door when we noticed a Porro prism binocular lying beside the Secret Service Officer standing there. He was a congenial fellow and we stopped to visit for a few minutes. You may remember that there is some distance between the front of the White House and the iron fence along Pennsylvania Avenue, although it doesn't look far on television. He said they used the binocular to see what was happening on the sidewalk or street. 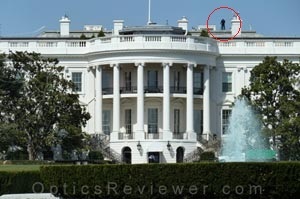 We wanted to know what kind of binocular the United States Secret Service would provide to its man standing guard at the front door of the White House! Because the ink was worn from the rubber armoring, he cheerfully held it up for us to see. It was an 8X40 Nikon Action EX binocular ! We were impressed! What was the result? We made up our mind to order the Action (EX) Extreme so we could test it and see for ourselves what it was like! Bird watchers already know how important a wide field of view is and don't need any further "coaching" on the subject. They know that if they're stuck with a narrow field of view, they're going to miss being able to see many (if not most) of the birds they see with the naked eye and then can't find with that narrow field of view binocular. Strangely enough, not all of the rest of us have figured that out yet, whether we want to see wild animals, wild people, or the starry nighttime heavens. Before we leave the topic, the wide field of view will also be very good for those looking for plane spotting binoculars and similar hobbies. To our way of thinking, there's just nothing quite as frustrating as trying to find a moving object, such as a plane, bird, etc, with narrow field of view optics! How Much of the Nikon Action EX's Field of View has Sharp Details? Using the binocular we purchased for this review, we found that details in the center of the field of view were clearly and sharply defined out to about 58&percnt; of the field of view's radius before they started to soften. We got out to about 70&percnt; of the field of view's radius before the image started to significantly blur or get fuzzy. An optical "sweet spot" that large is quite good. Since that much of the field of view is actually usable, you're getting a pretty good deal from an optical perspective. As with many binoculars (if not most! ), it appears that a very small amount of pincushion distortion is designed into the Action EX's optics in order to eliminate the "globe effect" or "rolling ball effect." It's such a small amount that we doubt you'll ever notice it — we had to specifically look for it while using our test binocular with a grid chart. A small exit pupil requires the eye to be more perfectly aligned with the binocular's optics before an image can be viewed. The exit pupil on our 8X40 was good at 5.0mm per specifications and provided for ease in getting the binocular up to our eyes so we could see through it quickly. However, some of the configurations have a significantly smaller exit pupil. The Action Extreme configuration with the smallest exit pupil is the 16X50 — at 3.1mm. When using the 16X50 during daylight, that size of exit pupil won't be difficult to work with. Also, this size of exit pupil may not present difficulties for nighttime astronomy's nighttime use for those of us who are getting older. However, a larger exit pupil may be desirable if a binocular is to be used at night by a younger set of eyes. When first getting started in astronomy, the relationship of age and exit pupil isn't always obvious — it pays to be familiar with it if you or someone else in your household may be affected. Although we're aware of some complaints by people seeing chromatic aberration with significant color fringing around dark or light objects viewed against a bright sky, our test unit showed only a scant amount. We didn't notice any significant color bias in the Action Extreme binocular used for our tests. That's a good thing. It indicates that the colors seen in its view are more true-to-life colors and not biased in any particular direction by the optics. Goods are produced within specified ranges of acceptability during manufacturing processes. It is normal for there to be minor variations between similar produced goods. While our test unit had an exceptionally good view with respect to chromatic aberration, we would usually consider it acceptable for a binocular at the Action Extreme's price point to demonstrate a modest amount. As is usually the case with a good binocular, it was possible for us to see better after sunset and before sunrise with the Action EX than without it. We felt it did well in this regard, particularly when remembering that it has multi-coated optics. When we focused on bright nighttime lights, such as lights for areas to park cars or for athletic fields, we didn't see any light spikes extending out from the light source in our views and that was good. We did, however, see glare in the view that we hadn't anticipated. That may be a factor if users expect to be using the Nikon Action Extreme binoculars under conditions that would include such lights or observing a bright, full moon. We understand from some that they've experienced glare when using the binocular in bright daylight conditions and facing in the general direction of the sun. It has been our experience that it's possible to induce glare with nearly any binocular, but that a minor adjustment in aligning the eyes with the exit pupil can often eliminate the glare. While not wearing eyeglasses and having the eyecups adjusted to be fully extended, we found that we were able to induce glare in some eye positions, but were able to get rid of it be changing the eye and exit pupil alignment. 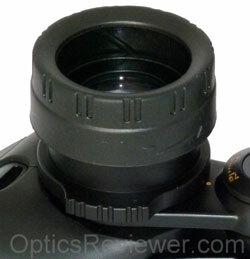 When we had the eyecups at their midpoint, we felt the glare was a bit worse for some of us. Your experience may be different, depending on your eyesight and other variables. How Close Could the 8X40 Action Extreme Focus? Nikon's specifications stipulated that the 8X40 Action EX would be able to focus sharply on objects as close as approximately 16.4ft (5.0m). When we put our test instrument on a tripod and started pulling it away from our target, we found we had a sharp focus at 9.9ft (3.0m). It's nearly two feet (61cm) more than we usually recommend for bird watching. Everything needs to be weighed and consider as a total. Does the close focus distance exceeding eight feet take the binocular out of consideration for bird watching? We don't think it will for most people, but we'll leave it up to you as to whether it's significant or not for your experience at the Action EX's price. 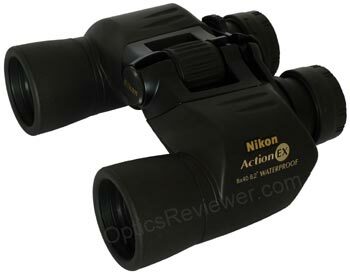 With the Nikon Action Extreme binoculars so good in other categories, we almost hate to discuss our initial thoughts about its diopter adjustment! The diopter adjusting ring seemed easy to move and had two tabs extending out from it on opposite sides of the ring. Those who know us will recall our enthusiasm for locking diopter adjusting mechanisms and we'll admit to being disappointed when we found the Action EX's adjusting ring didn't lock and wasn't very stiff to move. We were doubly skeptical when we noted the ring's protruding tabs which we thought would be easy to catch on clothing and change our diopter setting. Despite our doubts, we didn't notice that we had a lot of trouble with our settings being changed by mistake. Of all the things other Action EX owners talk about, we were surprised that this one isn't usually mentioned! Is the ease of changing the diopter adjustment big enough to be a deal breaker? We thought it was offset by the Action EX's great optics, but you'll want to consider how you're likely to use them and decide for yourself. We love the three-dimensional effect provided by Porro prisms and each time we test one it's like falling in love all over again. Don't misunderstand, we like roof prism binoculars, too! It's just that the depth of view is so nice in a Porro prism that it's nearly like being "right there" in the middle of things. Some people are hooked on the view and find it difficult to use roof prisms, although it's largely a matter of preference. It is noteworthy that the quality of view with a Porro prism binocular will cost roughly twice as much to achieve with a roof prism binocular, although the roof prism design is more durable and less prone to problems. We found that our 8X40 test unit seemed to fit easily into the hand. The fit of the parts was smooth and its overall finish was good. Having said that, one of the things that you will discover when talking with a number of Action EX owners is that they're not lightweights. Some individuals enjoy the fact that they're a bit heavier (the 8X40 we tested weighs in at 26.8oz&sol;760g) and feel that it indicates a level of durability. Others focus more on the weight on the neck strap. If you're inclined toward the Action EX, but have reservations about the weight, we suggest considering neck strap alternatives. A growing number of people are eloquently enthusiastic about using binocular harnesses which use the shoulders to support the weight instead of the neck (see Amazon.com or Amazon.co.uk ). Although it may not be a hot weather favorite, many value the Badlands Bino Strap (see Amazon.com ) for distributing weight evenly and for its lifetime transferrable warranty. The second option that many have found agreeable is to use extra-wide neck straps, usually meaning those two inches and wider, to distribute the weight over a greater area. These actually are comfortable and will often make an otherwise heavy binocular seem relatively weightless. While we don't recommend this model of binocular for backpackers because of both its bulkiness and weight, we do know of some backpackers who carry it. 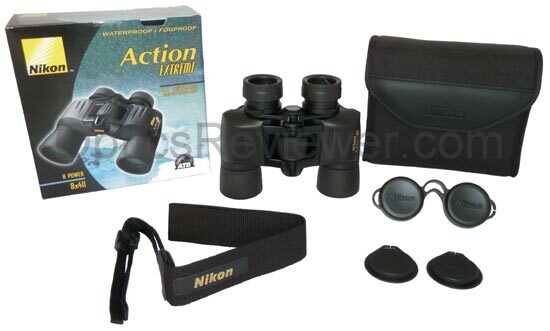 Many Action Extreme binocular owners have expressed appreciation for Nikon having made them waterproof. Nikon advises that they're waterproof to a depth of 3.3ft (1.0m) for up to five minutes and that it's not wise to use them or hold them in running water. We understand this to be because of the Porro prism's focusing mechanism design — which we'll tell you more about in the section on focusing the binocular. The reason they're fog-proof is because when the waterproofing seals are put into place, they'll hold out the potentially moist air. The moist air that may have been trapped inside the binocular while it was being made is replaced with dry, nitrogen gas. Without moist air inside, your binocular is not likely to develop internal fogging that poses the danger of damaging the optical coatings inside the binocular. Even with these features, it's wise to wipe your Action EX binocular dry, particularly the areas around the eyepieces and focus wheel, before using it after it has become wet. You'll still get a quick bit of fog on the exterior glass surfaces when you go from a cool temperature to a warmer one. That external fog isn't damaging to the optics, however, and quickly dissipates as the glass warms. Something that many of our eyeglass wearing friends value and appreciate about the Nikon Action Extreme is the generous eye relief. Depending on the configuration selected, it ranges from 17.1 to 17.8mm and are excellent for the majority of eyeglass wearers. Probably because of the long eye relief, the good quality twist-up&sol;twist-down eyecups have two intermediate settings between fully lowered (best for most eyeglass wearers) and fully extended. The intermediate stops are good, solid stops and you'll not find yourself accidently pushing the eyecups down if you press them against your face as many of us do. The focus wheel goes clockwise from close focus to infinity in one and a quarter revolutions of the focus wheel. We like that. We feel that anything less than a single revolution of the wheel to go from close focus to infinity is excessively fast and prevents achieving a sharp focus quickly. A full, single revolution is optimal in our opinion. If other considerations warrant it, we'll stretch so far as to accept 1.5 revolutions, although that seems quite slow when you're in a hurry! The focus wheel has a rubber texture coating that provides a nice, gripping surface under most circumstances. In some situations, we observed that it could be a bit more difficult to turn if our fingers were wet. Because focusing the Porro prism binocular involves changing the distance between oculars and objectives on the outside (you can see parts moving back and forth) waterproofing is more difficult. The waterproofing involves both O-rings and using a lubricant that will allow parts to move back and forth properly without letting water get inside. We believe that's the reason there's a little more resistance to the focus wheel than you might get with a roof prism where the movements are internal. Just because we were curious (and thought you would be, too! ), we put the Action EX we were testing in a refrigerator to see if being cooled down would stiffen the focus wheel's movement. Interestingly enough, it didn't seem to make much difference in the wheel's resistance, so we put the binocular in the freezer to see what that would do. Why would we do that? Many of our readers use binoculars in the cool spring and autumn weather. A number of them look for binoculars that will still be usable in northern climates during cold winter months. When we got the binocular down to about 0°F (-18°C), we noticed that it took significantly more effort to turn the focus wheel. We wouldn't consider the Action EX to be appropriate for cold, winter temperatures in northern climates because of that. We don't think it will damage the binocular to use it a few times in those temperatures, but we would want to have a binocular which would focus quickly when we needed to use it! We were interested in what happened on the exterior lens surfaces when they warmed up and the condensation (external fogging) evaporated. It left tiny watermarks on the lens surfaces. Since we didn't want those spoiling our view, we used a Carson Lens Cleaner (Amazon.com ) with their nano-particle cleaning formula to wipe away the watermarks without damaging the lens coatings and, with very little effort, the lenses were quickly clear and sparkling. Many times readers wonder where a particular binocular was made. In response to that, we've done what we can to let folks know where something is made when we do substantive testing and write up a detailed review. 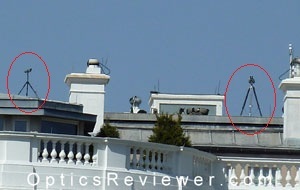 We looked the binocular over carefully and didn't notice any indication of a country of manufacture. On the bottom of the box it came in, however, under the universal price code ("bar code") it says "Made in China." We're tempted to assume that means the binocular was made in an optical manufacturing plant in China. Whether we're right or not, it appears to us that Nikon's reputation for quality is still good with the Action EX. What Did We Get When We Bought Our Nikon Action Extreme? In addition to the binocular itself, a neck strap that's 1.5in (3.8cm) wide was included that was comfortable for us. A lightly padded case made of perhaps nylon or polyester fabric with soft interior surface is also included. It has a belt loop sewn onto the middle of the back, however thought that was likely for putting the empty case on our belt and not for using when the binocular is in the case. The case itself does not have a neck or shoulder strap, but has cutouts in the Velcro-sealing flap to allow the binocular's neck strap to be used while the binocular is in the case. A rain guard for the oculars and covers for the objective lenses were included. The rain guard seemed serviceable, although it was made of a somewhat stiff, somewhat slippery feeling plastic. The covers for the objective lenses felt as though they were made of the same type of material and covered the objectives by a flange fitting inside the barrel — just beyond the objective lenses. We thought the lens covers were likely to be lost easily and left them in the box. 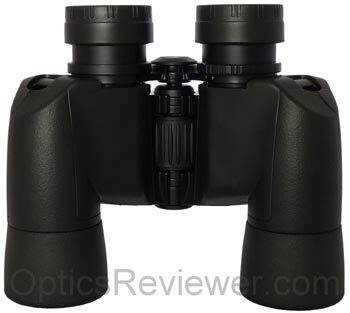 Warranty card, instruction manual, and product guide documents are included with the binocular. A thoughtful item is the tripod adapter that's included as a standard item with the 16X50 configuration. It's optional with other configurations. 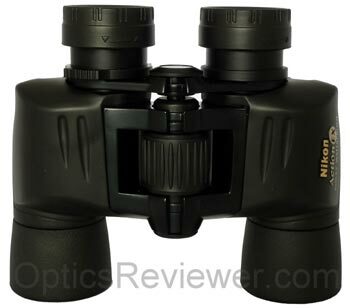 We are impressed with the Nikon Action EX binoculars. Nikon has packed a lot of performance into a package that represents an excellent value for its price. Its overall feel and friendliness to those of us who wear eyeglasses are both excellent. It has a terrific field of view and excellent color rendering. We just plain like it! It's difficult to list uses for a binocular like this, since it seems as though most would find the optics at this price significantly above average. Certainly bird watchers, outdoors enthusiasts, neighborhood watch volunteers, hunters, sports fans — where should the list be stopped? Anyone living in a rural area would want to be able to see what is taking place beyond what normal vision can see…. Want to check out the availability and pricing at our favorite online retailer? We buy a lot from Amazon and find they typically have the lowest prices and the best customer service. Here are direct links for the Action EX at Amazon.com for the USA and Amazon.co.uk for our friends in the UK, South Africa, New Zealand and Australia. 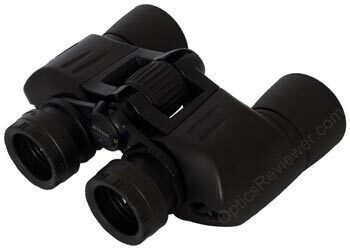 To get the same optical quality in a roof prism design we estimate that we would need to spend at least double the price of this binocular and probably more — we got a lot of optical performance for our money when we bought it! Nikon's 25 Year Limited Plus No-fault Warranties are excellent. They cover the binoculars during the time that you would expect them to be in their prime and functioning smoothly. If yours require a service or repair not covered under the limited warranty, you'll want to tuck $10 in with them and you'll be responsible for return shipping and handling. Even if the problem was your own fault.